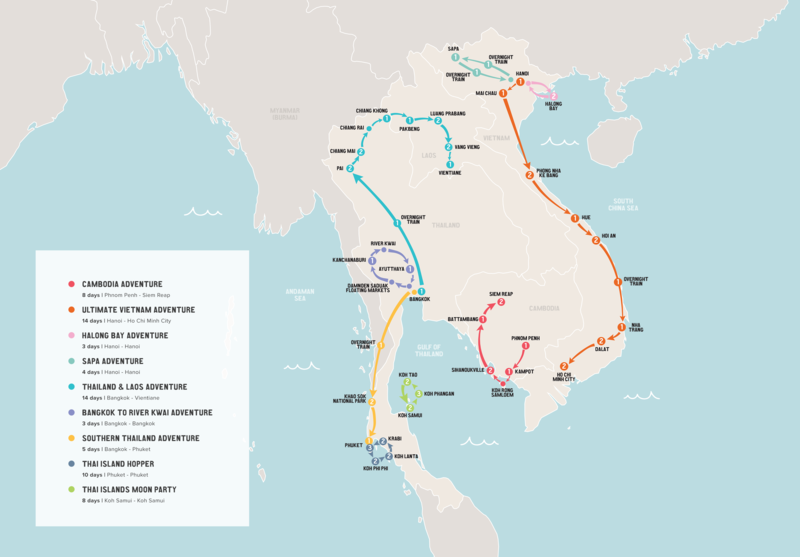 Discover all that Southeast Asia has to offer at your own pace for 3-month. Our Unlimited Asia Pass allows you to travel once on all of our Asia trips within a 3-month period. You choose where you start and finish, and everything in between. Explore the lush landscapes, kind locals and the tastiest exotic foods of Southeast Asia at your own pace! The catch? There isn't one! Explore the unexplored for 3 months from . Send me information about Asia Unlimited Pass and update me when there are relevant deals available. Why Book Asia Unlimited Pass? With a mixture of buzzing big cities and off-the-beaten-track destinations, the spots we visit will give you the ultimate travel experience across Southeast Asia. Our guides are local to the area and natural born adventurers, so you can count on them to give you expert advice and show you the very best hidden gems. When you travel with us, it’s easy to meet other fun and independent travellers on the road. You’ll soon have a bunch of new friends! We use a mixture of private vans, boats and trains so that you can kick back and relax, and take in the scenery. Whether it’s a hotel, stilted house, or a jungle raft, we always make sure your accommodation adds something to the experience without compromising on comfort. There’s a huge range of optional activities on offer, and you have the flexibility to choose which ones you want to experience. Our Asia trips cover four incredible countries, each of them special in their own way. 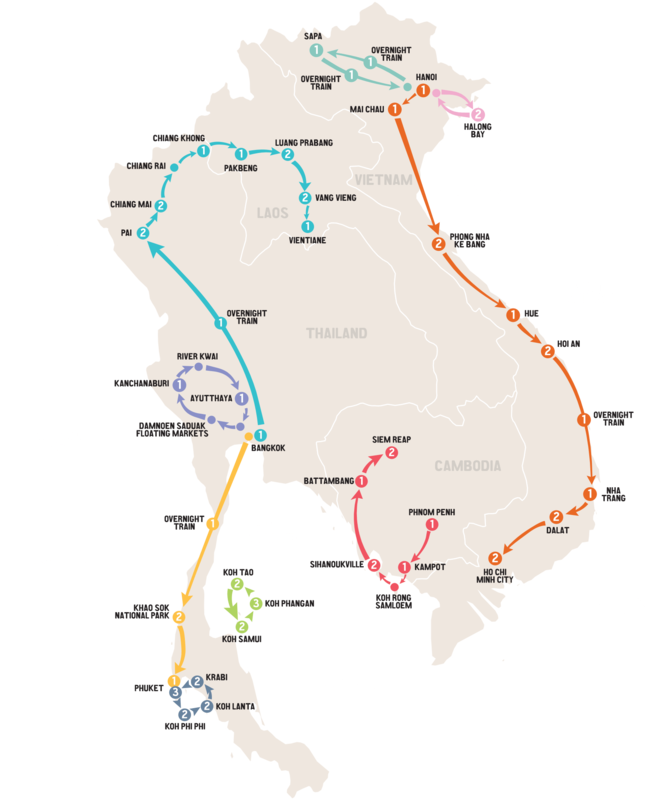 From the never ending rolling hills of Vietnam to the lush jungle scenery of Laos, the ancient temples of Cambodia and the slice of paradise that are the Thai islands you can expect to experience a bit of everything this corner of the world has to offer. Vietnam is the perfect travel dish. On this adventure, you fill your belly with the most nutritious experiences of Vietnam, stay in a homestay as close to the local culture as possible, and discover the caves, valleys, and vistas that adorn all the Vietnam travel guides. On this trip, we show you there’s more to Cambodia than the temples. Discover the beautiful beaches of Koh Rong Samloem, learn about the country’s difficult history at the S-21 Prison, and taste some delicious cuisine. Go beyond the temples and get immersed in the culture and curiosities of Cambodia. Sail through this UNESCO World Heritage wonderland and experience the best bits as you snorkel in the clear seas, devour delicious local food in a floating village, and karaoke all-night in the on-board bar. We promise you’ll struggle to find anything quite as beautiful. When you take this trip, you trek through the postcard-perfect rice paddies of Sapa with a guide and move in with the locals for a night in a traditional homestay. It’s the perfect accompaniment to your Vietnam adventure! On this trip you experience the best of both worlds. Discover Bangkok’s soulful sights and sinful nightlife, get your adrenaline fix by kayaking in Vang Vieng and venturing into the deep caves near Pai, and hang out with the majestic monks in Luang Prabang and the awesome elephants in Chiang Mai. On this trip, we help you understand why the Thai people are so content. Become heroically happy when you float down the River Kwai, feel elated by the delicious treats you eat at the night market in Pai, and hang out with the beautiful elephants of Chiang Mai. On this tempting trip, spend an afternoon exploring the temples of Thailand’s capital, go to heavenly Khao Sok National Park, swim in clear jungle rivers, and play with the cutest elephant before you finish up on the beautiful island of Phuket! Indulge in the stereotypical tropical island dreams of every traveller on this trip! Go on epic snorkelling adventures amongst beautiful limestone karsts, hike up to temples and sublime sunset spots, and dance amongst the fire throwers at all night parties. Let yourself go loony at the best party in all of Southeast Asia. See half-naked people dancing like maniacs, witness insane fire throwing antics, and spot saucy acts in very peculiar places. Best of all, we make sure you enjoy all the madness! Contact your local Busabout agent to learn more. Explore the unexplored. Asia is waiting for you.